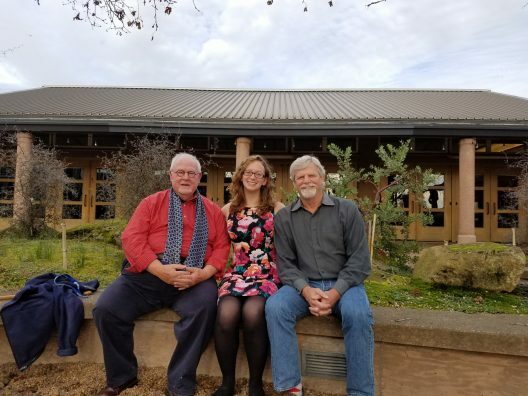 Pictured are Dr. John A. Wott, Director emeritus, UW Botanic Gardens; Kelsey Taylor, recipient; and Fred Hoyt, Interim Director, UW Botanic Gardens. The winner of the John A. Wott Botanic Gardens Endowed Fellowship for 2016 is Kelsey Taylor, School of Environmental and Forest Sciences M.S. candidate. Kelsey was selected earlier this year through the leadership of the late Dr. Sarah Reichard, Director UW Botanic Gardens. Kelsey is a Washington native who has enjoyed an outdoor education since her formative years. Her interest in research began as an undergraduate, where she worked on stream-side restoration and renewal of salt water marshes in coastal Virginia. Her current research looks at the physiology and competitive ability of garden loosestrife (Lysimachia vulgaris), a Class B invasive wetland plant. The project focuses on the trade-offs of competition with native wetland plants and looks at the potential for restoration at infested sites. Kelsey has also been involved in several projects in the Washington Park Arboretum. Pictured are Dr. John A. Wott, Director emeritus, UW Botanic Gardens; Kelsey Taylor, recipient; and Fred Hoyt, Interim Director, UWBG.